Pangassius Tropical Fish Learn all about the Pangassius's feeding habits and food types, its behaviour, its origins, its natural habitats, is it male or female, breeding advice and information, suitable tank mates, its sizing and growth range, minimum tank size, water PH and more. Use our fish community creator tool to plan your tank set up and ensure that the Pangassius is the right fish for your aquarium. Unfortunately, Pangassius are still regularly available in many aquatic stores although they are highly unsuitable for home aquariums. The fish naturally grows up to 130cm, although due to inadequate aquarium conditions, usually reaches around 30cm before an early death. Pangassius are incredibly nervous, fleeing at the slightest sudden movement, vibration, or change in light, often hitting the glass and resulting in damage to the fish. These fish can only be kept in huge aquariums (e.g. public aquariums) or tropical ponds and should never be kept in home aquariums. Do not purchase these fish and if you see a store selling them, Think Fish encourages you to print out and show them this page in order to point out their mistake and/or lack of responsibility to fishkeeping. If you already have Pangassius you have a duty and responsibility to care for them properly. If you do not have the means to care for them and were not informed of their needs during purchase, you should arrange to take them back to the store. If you have a question about keeping Pangassius's then please use our Pangassius help forum. Join 100's of other fish enthusiasts with 1000's of years experience between them caring for and keeping fish like these. 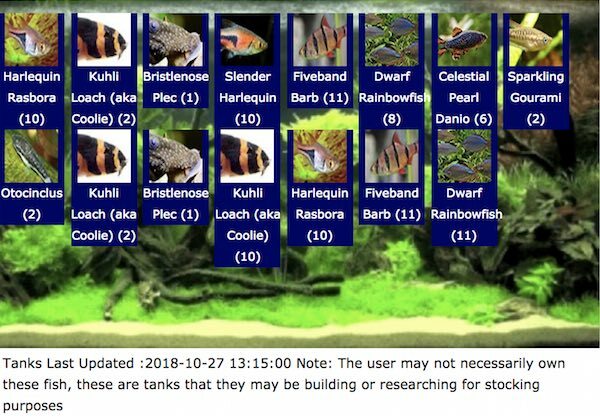 You are in the thinkfish community creator for the Pangassius fish species, you can learn all about how the tool works in assessing fish tank mate compatibility at the link provided or use the tool tips provided to guide you. Create a test fish community that includes the Pangassius species and any other types of fish or crustacean you'd like to introduce - You can assess the best companions, tank size suitability, stocking levels based on filter type and volume and possible negative interactions and warnings as you build up your aquarium. Please do check your water type for compatibility with your fish, which can be found on the Pangassius information box above and your local water company providers website. Don't waste your money and endanger your fish! If you'd like to talk about the "Pangassius" with our users, then we have a buzzing community of fish enthusiasts where you can talk about tank issues, Pangassius fish behaviour, Pangassius tank stocking and any other issues related to the Pangassius fish or other types you may have.